Figure 1. Field peas closing canopy. Easy implementation — modifications to crop rotation or farm equipment are not necessary. Breaking weed and pest cycles, thereby reducing the number of herbicide/pesticide applications and delaying the evolution of resistance in troublesome weeds/pests. Gain rotational benefits such as N fixation (10-24 lb/ac), and increase in soil organic matter and populations of beneficial insects and soil mycorrhizal fungi. Better water utilization by allowing sufficient time for summer rains to recharge soil profile and ensure good winter wheat establishment. Trade-offs are that field peas may deplete soil moisture and potentially reduce the yield of succeeding wheat crop (yield penalty = 5-6 bu/ac/inch), especially in dry years. Most agronomic recommendations for field peas come from University research conducted in Canada, the northern US, and the Pacific Northwest. Little information is available on how field peas respond to different agronomic practices in semiarid Nebraska. Therefore, the objective of this on-farm research study was to determine the optimum population density for field peas in western Nebraska. This study was conducted on a cooperator’s field located in Perkins County. The experimental design was a Randomized Complete Block Design with four replications and seven treatments (total of 28 field strips, each 40 ft x 230 ft). The field site had Rosebud loam soil type and was historically operated under a no-till system in a winter wheat-summer fallow crop rotation. The crop received 10 inches of precipitation during the growing season. The field pea cultivar DS Admiral was inoculated with Cell Tech liquid inoculate and planted in strips on May 1 in what normally would have been a fallow year. Glyphosate herbicide (RoundUp®) was applied across the field site at a rate of 32 oz/ac after planting and before emergence to control weeds. The crop was harvested July 28, 2015,.
where, Y is crop yield (bu/ac), X is plant population (plants/ac), the parameter c is the lower limit (set to 0), the parameter d is the upper limit (maximum yield) and the parameter e describes the expected change in Y as X increases. Results show that yield response to plant population is linear at low densities (0 to 150,000 plants/ac), then continues to increase with decreasing rate (150,000-200,000 plants/ac), begins to plateau at about 200,000 plants/ac), and reaches its maximum yield at approximately 310,000 plants/ac (Figure 2A). Due to the low germination rate (58%), yield response at higher populations were not obtained in this study, thereby more data needs to be collected to describe yield response at populations higher than 310,000 plants/ac (Figure 2A). Differences were observed in maximum attainable field pea yield under given environmental conditions, suggesting that optimal planting population may depend on the yield goal each farmer sets up for his field pea crop (Figure 2A). Similar to other crops, planting lower populations for lower yield goal (28 bu/ac) and higher populations for a higher yield goal (37 bu/ac) may be justified to in both agronomic and economic sense (Figure 2A). Economically optimal populations (EOP) can be defined as population (in plants/ac) that maximizes profit made on investment, which in this case is the seed cost. Thus, planting higher populations to maximize yield potential is not always the best economic strategy due to the asymptotic nature of yield response to planting density (Figure 2B). The additional seed cost to obtain yields above the EOP will never be recovered. the multi year/location data on field pea response to planting population needs to be collected to draw conclusions. Under these assumptions, the economically optimal population (EOP) (i.e. maximum profit) for field peas is 220,000 plants/ac, which corresponds to 116 lb of seed/ac seeding rate. About $0.19/ac penalty may occur for each additional pound of seed planted over this EOP (Figure 2). As the current recommendation for planting populations ranges from 180 to 200 lb/ac, these results indicate farmers can save up to $16/ac when planting at the economically optimal population. Refer to Table 2 for determining EOP and seeding rates under few different scenarios. Table 2. Profit driven EOP and seeding rates for certified field pea seed (90% germination) and bin-run seed (80% germination) as affected by different prices of field peas on the market. Results based on one year on-farm research study. This study was the first attempt to evaluate population recommendations used in other regions for suitability in western Nebraska. The results provide an early look at continuing research to identify the optimal field pea seeding rate for western Nebraska. 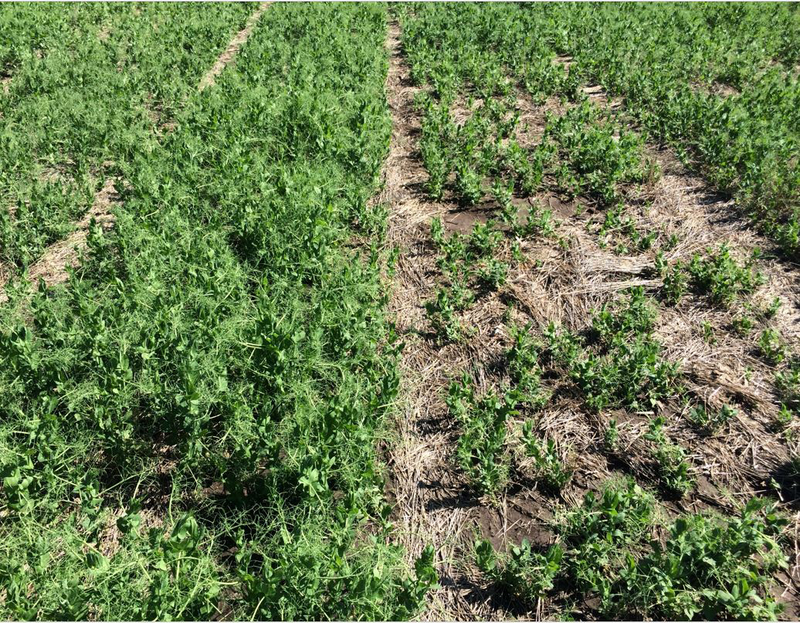 Although this study shows the potential for reduction in field pea populations without lowering profits, these results have yet to be confirmed in additional production years and/or locations in western Nebraska and should be considered cautiously until further research has been completed. Current recommendations for field pea seeding rates range from 170 to 210 lb/ac. 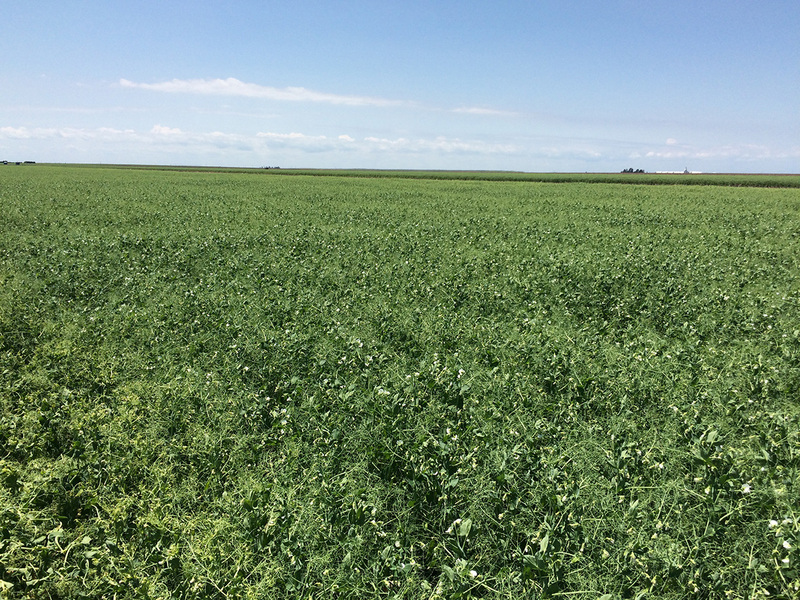 Farmers in southwest Nebraska and UNL researchers are financially supported by USDA’s Sustainable Agriculture Research and Education (SARE) program and field pea seed industry to continue addressing issues of sustainable field pea production in western Nebraska. Thank you to Steven Tucker of Venango for conducting this on-farm study and being a source of research ideas, coordinating establishment of small plot research, and hosting field tours that included educational outreach and field demonstrations.